Hull made a variety of items along with historic pieces such as the Donkey/Rider that was sent to President Franklin D. Roosevelt during World War II and was on his desk up until he died. This piece is now in the Smithsonian on display with his other memorabilia. A display of pottery from a previous show. All pieces can be viewed and many will even be for sale. 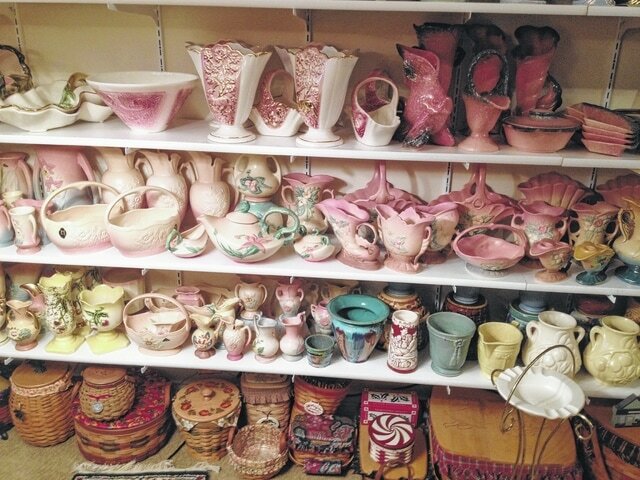 CROOKSVILLE — The Hull Pottery Association 22nd annual Show & Sale will be July 10-11 at the Crooksville High School, which is located one mile south of Crooksville on Ohio State Route 93. Iva Sisson, of Rutland, is a longtime collector of Hull pottery and said this is the largest Hull Pottery Show in the world. In addition to pottery and friends, there will be lots of drawings and giveaways. A luncheon at noon July 11 will honor past Hull Pottery Co. employees, with the HPA auction starting at 2 p.m. The luncheon is open to members. A dinner will also be Saturday afternoon for all Hull employees. There will be a demonstration on how to make pottery. While pottery pieces can be viewed, Sisson emphasized that many pieces will be for sale as well. Hundreds of authentic, rare and one-of-a-kind pieces of Hull Pottery, and many other favorite pottery pieces, will be on display. The public is invited to join members, dealers and collectors from all over the United States for the 22nd annual show and sale in the pottery capitol of the world. The HPA annual social for HPA members will be 6-8 p.m. July 9 at the Roseville Community Center. Reach Lindsay Kriz at 740-992-2155 EXT. 2555.